At Unified Technologies, it is no secret that we believe the success of our company comes directly from the fantastic partners that we are privileged to do business with. 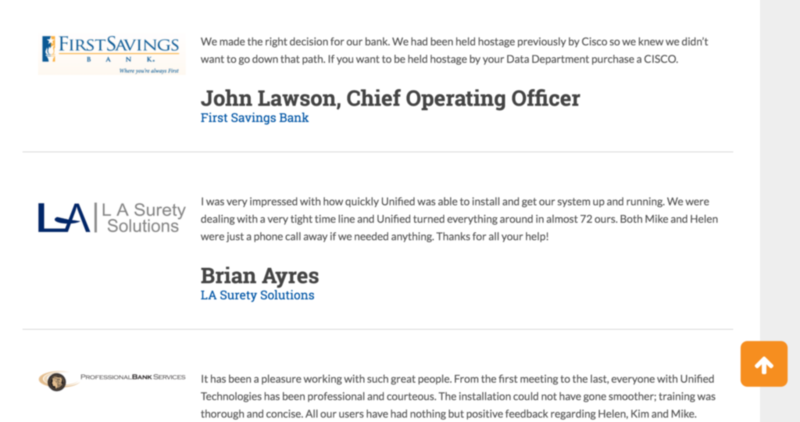 We recently collected quotes we have received from our partners over the years and updated our website’s testimonial page. We wanted the ability to search for testimonials by industry, so at the top, you will see a list of the industries that are represented on the page. Click on the category and you will be taken to that spot on the page. We have been tweaking this page and we are thrilled to be able to unveil it to you! We are proud of the service we deliver and the team we have in place but don’t take our word for it.Take a look at it now! Should you decide to pick another industry to peruse, simply click on the orange ‘up’ arrow to return to the top of the page, allowing you to select another industry. We hope that you take the time to check out our newest upgrade to our site, we are extremely proud to be able to showcase the amazing businesses that we are privileged to work with. If your company isn’t on this list, we would love to chat with you if you think that the time is right to consider a managed phone system. You can talk to one of our technology specialists now to schedule your free consultation. Previous Post: « The Customer Service Report Card – Can you get Straight A’s from your team?